Sun and earth come together to create the beauty of nature. The Christ-Light and the soul come together to create the beauty of humanity. I receive light from the limitless mercy of the Spirit. My soul takes the form of a prayer in action. As the prism reveals the colors of the rainbow, allowing itself to receive and release the light of the sun -, so can also my heart reveal all the colors of the Godhead if it allows itself to receice and release the pure light of the Spirit. You and I are the same, one divine idea reaching through nature, humanity and cosmos. your inseminating mother earth relates to Saturn and to my crown chakra. I belong to you in deepest peace. I trust my fellow man. ...from the wonderful clairvoyant priesthood of the old... to the new clairvoyance and the divine willpower we harden in the meeting with evil. - I feel the stream of force carrying me forward. He fills me with purity and wealth. even in straying still source of life. I am Azraels helper on earth. between the souls of men. their future, their present, their past. Azraels divine presence gives me the capability to serve them. 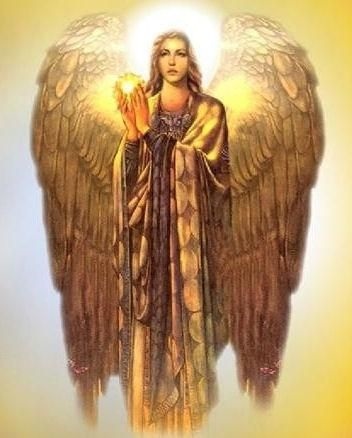 within the sphere of soul-power-receiving angels. transforming them into young, still unborn sunlight, into the song of earth-life to come. I release them now.